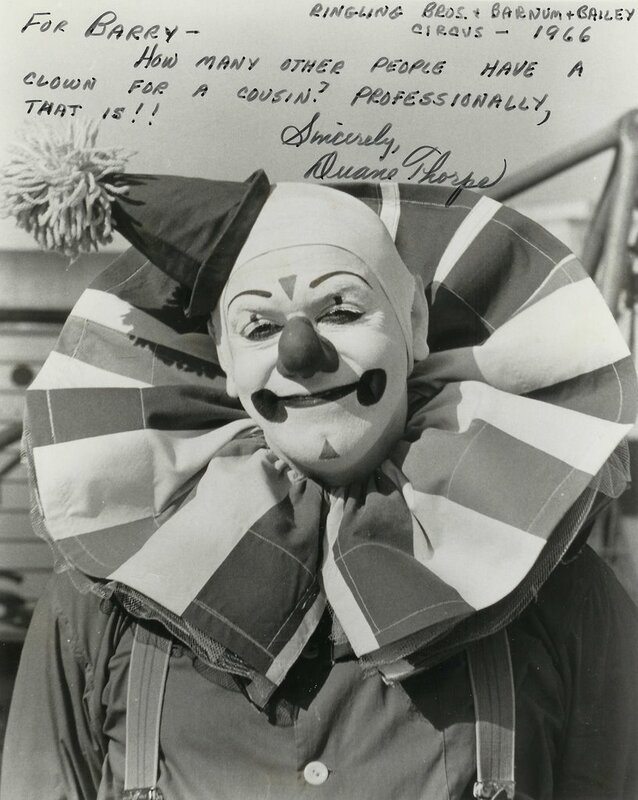 I've had several people email me questions about the four Ringling "Master Clowns", how they were chosen, why others weren't and why there hasn't been any new Master Clowns since 1983? I don't know. It seems like it's an idea that appealed to Irvin Feld exclusively and died with him. 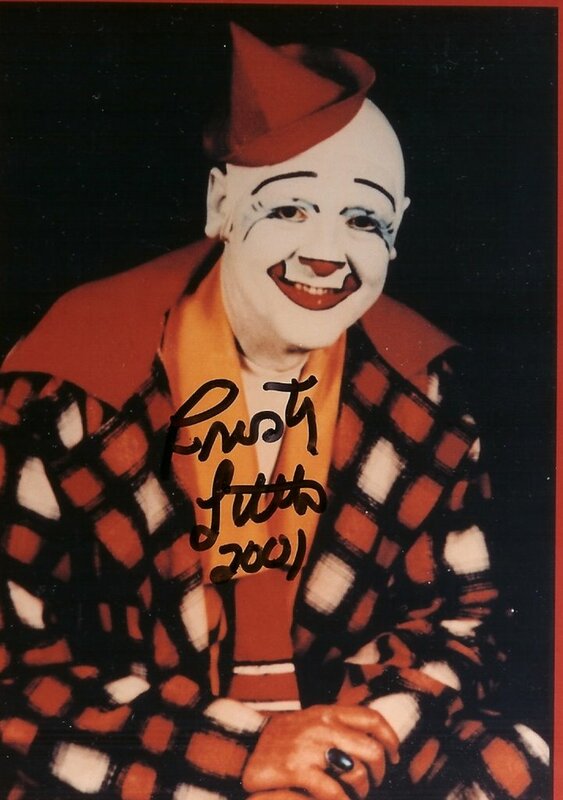 Frosty Little's book CIRCUS STORIES states that in order to be considered for the title of Master Clown one must "have spent 15 years performing on the Ringling show, you have to have been a teacher at Clown College for a minimum of 10 years. You also have to have created 50 gags that were used in the show and you have to have been an advance clown, plus have a license in pyrotechnics and have worked as a Goodwill Ambassador for the show". Under that criterea NONE of the four Ringling Master Clowns qualify! 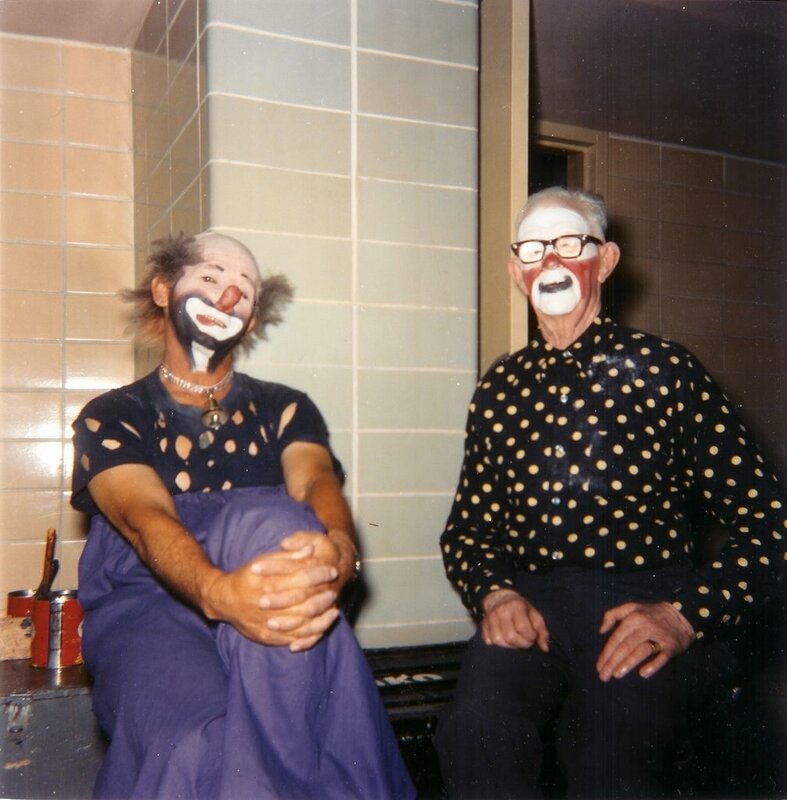 Lou and Otto were the first two and while both had done advance work neither were "advance clowns", they had always been "show clowns". I doubt either had a pyro license but they might have. 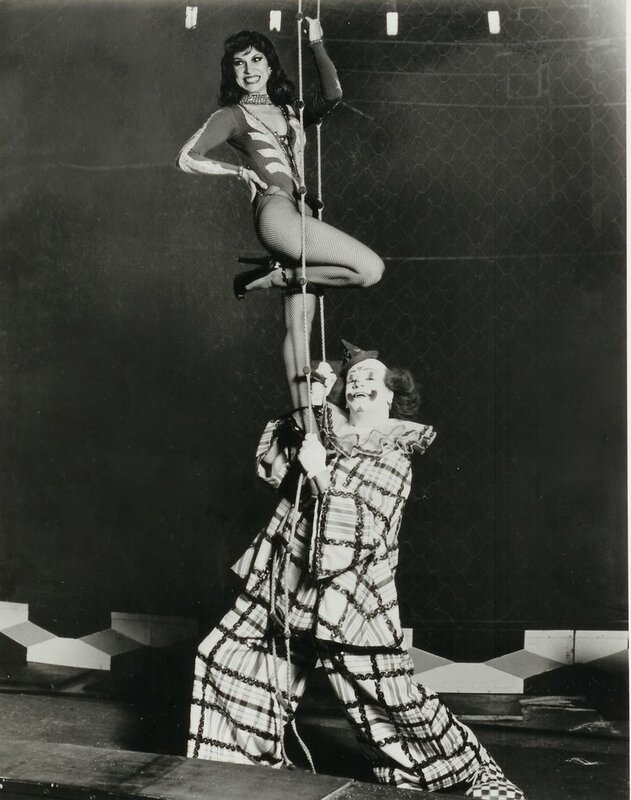 Both had worked on the show long enough but neither had taught at Clown College 10 years when they received the title, it hadn't been opened long enough. Both had written "50 gags", easily. 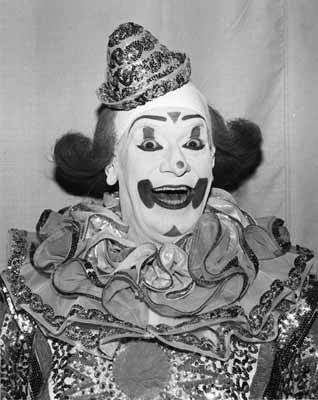 Bobby Kay had a long Ringling show career and extensive experience as a "Goodwill Ambassador" and advance clown. He taught at Clown College for many years but had not taught there for 10 years when he was honored with the title. I doubt he had a pyro license but again, he may have. Bobby probably had no trouble reaching the 50 gag mark either. Frosty Little had the time served, the pyro license, the 50 gags and taught at Clown College for at least 10 years when the honor was bestowed upon him. But again, while Frosty had done advance work he had never worked exclusively as an "advance clown", he was always a "show clown", a "Boss Clown" in fact...the Boss Clown of BOTH units of the show! Why weren't Mark Anthony, Coco Polikov, Danny Chapman, Prince Paul, Duane Thorpe, Steve Smith, Tom and Tammy Parish, Greg and Karen DeSanto or Huel Speight honored? They probably all qualify (or come as close as the chosen four do), but for whatever reason the program ended with these four very talented men and doesn't look to be revived anytime soon. 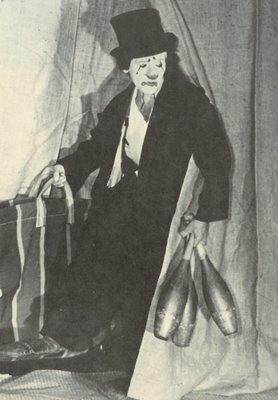 Although in early years he was seen as a whiteface, Mark Anthony spent the majority of his career as a truly unique and original tramp clown character. "Mark Anthony was born Mark Galkowski in Norwich, Connecticut. During the depression, he joined the circus. Except for a stint in the Merchant Marines, he spent most of his life working with various large and small circuses: Sells-Floto, Harris Show, Dan Rice Circus, Clyde Beatty and Ringling Bros. and Barnum & Bailey." Mark on the Clyde Beatty Circus (NOT the Clyde Beatty-Cole Bros, Circus) in either the late 40s or early 50s. "In all the years that I knew Mark I never saw him mad at anything or anyone." He was a master sculptor and prop maker. 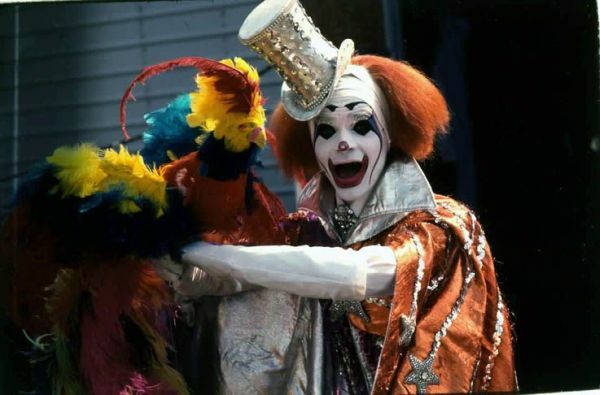 He loved to carve and created hundreds of different clown props from wood, paper mache and most famously, foam. "Mark was the prince of foam carvers, and one time he carved a full-sized elephant out of foam. On the Red Unit in the 70s, I asked Mark about carving a skeleton. He told me how to start and what to do but it took me six months to carve a six foot one. All I had to finish was the skull. I kept working on it, carved out a lot of trial ones, but they all ended up the size of an orange by the time I finished 'adjusting' them down. Finally I got the right size and shape for a skull, and finished the skeleton after eight months." When asked how you carve a foam elephant Mark's oft-quoted reply was, "Just cut away the parts that don't look like an elephant." "He was what you'd call 'down home folks', and was everybody's friend. Everyone was his friend, and we all loved him. Mark and Bobby Kay were very good friendsand both of these men were kind and gentle...Thank you Mark, for teaching me to carve foam. We miss you very much." "His kindness, desire to help others learn and his humble nature are qualities that will not be soon forgotten. " HAROLD RONK, the 17th Ringmaster in the history of the of the Ringling Bros. and Barnum & Bailey Circus and the first of their "Singing Ringmasters" of so many, many years and loved by all who knew him, passed away peacefully at Graham Hospital, Canton, Illinois at 5:50 a.m. Central Standard Time, Wednesday, August 2, 2006. Harold was a graduate of Bradly University, Peoria, Illinois. He was aNavy Veteran having served his time in the South Pacific during WorldWar 2. He will be cremated and interned between his mother and father at a grave in Greenwood Cemetery, Canton, Ill. on Monday, August 7, at 10 a.m.
A laser photo of Harold in full costume will be placed on the tombstone along side of the laser photo Harold had already placed there of his beloved dachshund dog, Tristan. Harold Ronk #17 (1957, 1960 - 1968, 1969 - 1972, 1974 - 1976, 1978 - 1980) - Ronk was the Ringmaster of Ringling Bros. and Barnum & Bailey circus in 1957 and from 1960-1968. 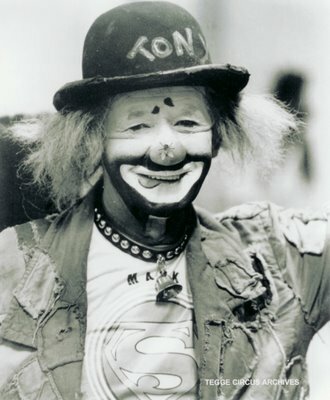 When The Greatest Show On Earth began touring two separate units in 1969, Ronk joined the Blue Unit. "People generally recall Harold Ronk as expanding the role of the singing ringmaster; there were actually soloists singling with the circus band several decades before, but they did not serve a dual role as announcer. " May Harold Ronk, the greatest Ringling Bros and Barnum & Bailey Circus ringmaster of all time rest in peace in the Risen Lord Jesus for all eternity. Those of us who remember him through the years with Ringling was a great person and always had a nice smile and always had the time to talk with many of us who were his admirers. Thanks to Jackie LeClaire for sharing this news with us and for keeping in contact with Harold Ronk. Let us remember him in our Prayers and in our daily Masses. God Bless Harold Ronk and may he live in peace forever in the arms of the Risen Lord with no more pain or sickenss. Jeez Louise and Holy Macaroni, does that look like a circus clown or what?!? 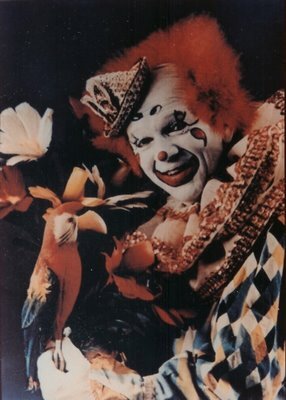 Dale Longmire, who began, after Clown College, on the Ringling show, shown here on the Vargas show in the 1980s. Dale is currently the Contracting Agent for the Walker Bros. Circus. Billy McCabe on Circus Vargas in the 1980s. Billy was on the Vargas show when he recorded the video tape that is currently available from Bobby Hakes on eBay. I don't know what it was originally intended for but it's a tape of Billy "holding court" in his trailer and pontificating on a series of subjects as he applies his makeup. 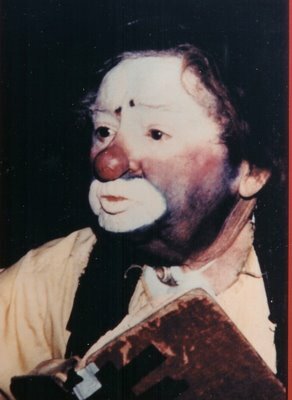 It's a very interesting study of a man who clowned on various circuses for years and kept the traditions of the neat circus whiteface (as one would have seen from the late 40s through the 1950s) alive MUCH longer than one would have thought possible; truly the last of a dying breed. The type of clown you just won't see anywhere on any show anymore. Paul Jung chatting up some circus ladies. It's a proven fact that no woman can resist the charms of a professional circus clown once he starts working his mojo. This is an awesome power that must only ever be used for good. 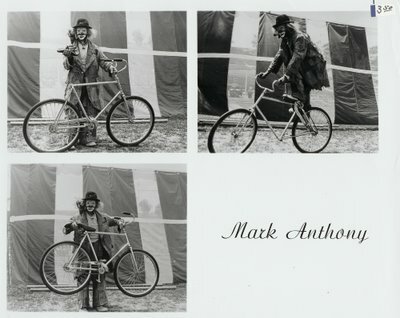 Mark Anthony's promo shots for his breakaway bicycle act. It was similar to Joe Jackson's (Sr. and Jr.'s) vaudeville act in concept but I've been told that Mark had a very different take on the act, the way that Lou Jacobs, Toto, Kinko Sunberry, Bobo Barnett, Hip Raymond and Billy Vaughn all used "midget cars" but each used them in a different way, with a different style and created very different acts. Greg DeSanto points out that "Soapy" was a childhood nickname of Duane Thorpe's the way that "Frosty" was for Glen Little, which reminded me that Frosty hasn't appeared here yet. 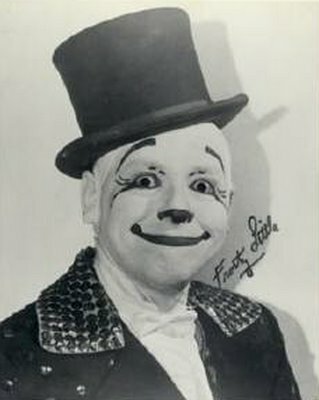 So here he is, America's Only Living Master Clown...Mr. Glen "Frosty" Little, looking very debonair in his formal wear. Inducted into the International Clown Hall of Fame in 2000, Duane "Uncle Soapy" Thorpe is one of the few clowns to have had a successful career while working for only one circus. (Although Duane was in his fair share of soap gags through the years, his moniker was actually based on a family nickname.) A professional dancer, Duane sought a job with Ringling Bros. and Barnum & Bailey for the fresh air and good food. He was given a job in the wardrobe department. Before long, he was learning to be a web sitter for the aerial ballet. In 1950 he made it to Clown Alley and stayed there until 1986. Duane's list of accomplishments is quite lengthy. 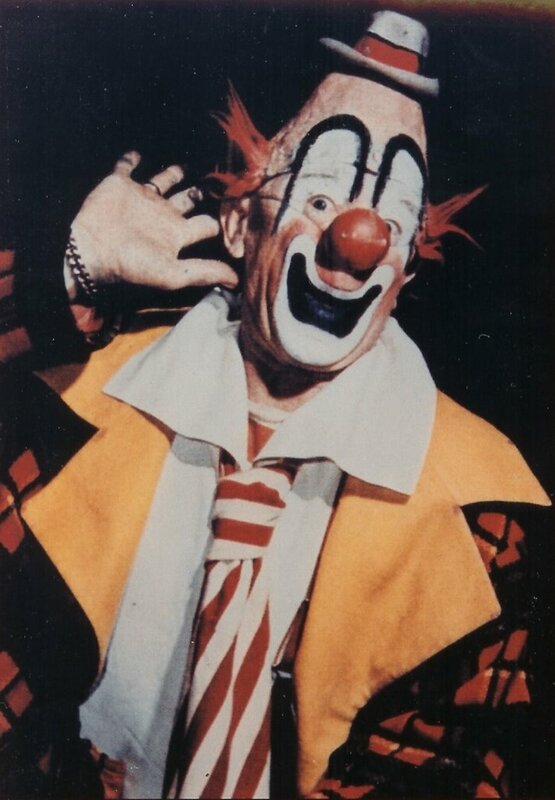 A prolific producing clown, he created ring gags, track gags, and numerous walkarounds. 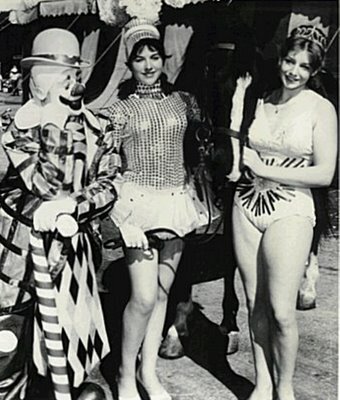 Duane Thorpe was associated with the Ringling Brothers and Barnum & Bailey Circus from 1949 to 1990. 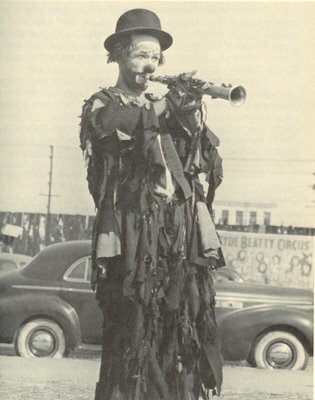 He was a member of the clown alley for thirty-six years (1950-1986). 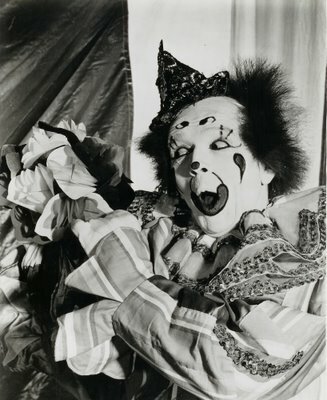 He was a prolific producing clown, often working with Paul Jung, and created ring gags, track gags, and many walkarounds. 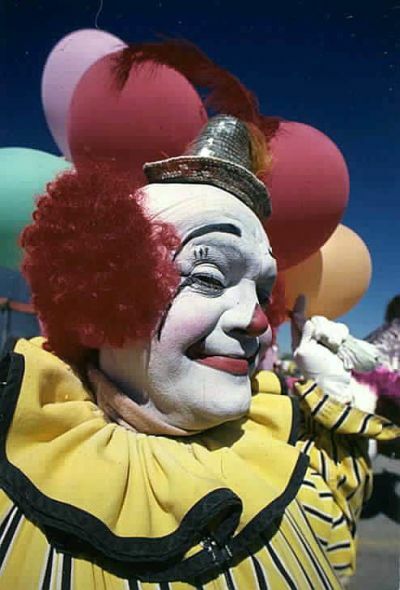 When Irvin Feld started the Ringling Brothers Barnum & Bailey Clown College, he publicly declared the existing clowns with the show were too old to be good clowns. With few exceptions, these old clowns resented the young Clown College graduates. Duane Thorpe was one of the exceptions. He is fondly remembered by many of the graduates because of his willingness to help and encourage them. 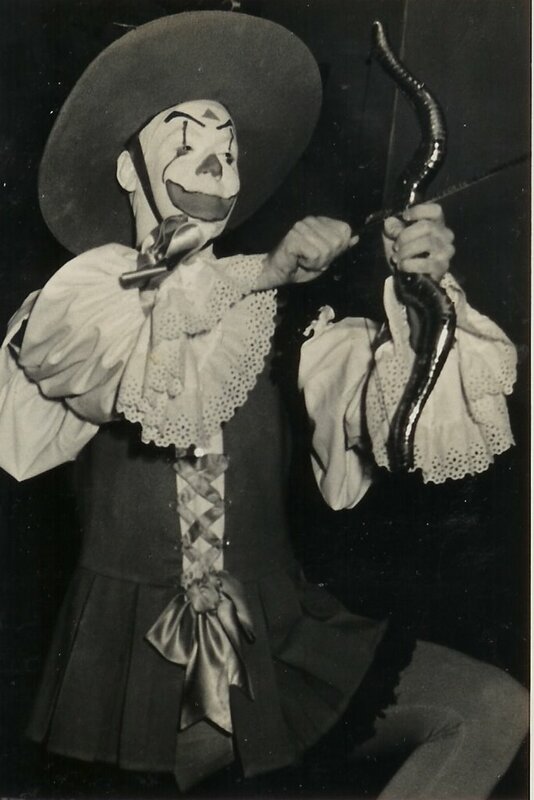 The rarest Duane Thorpe photo in my collection, the future "Uncle Soapy" in his very first clown makeup at the old Madison Square Garden (49th/50th streets and 8th Ave.) with the Ringling show in 1950. How many people have a clown for a cousin? Professionally that is!! "Soapy" in his picture day finest holding the ladder for Patti from the Canestrelli family during a photo session for the 109th edition. "Uncle Soapy" as most of us remember seeing him in the 70s and 80s. 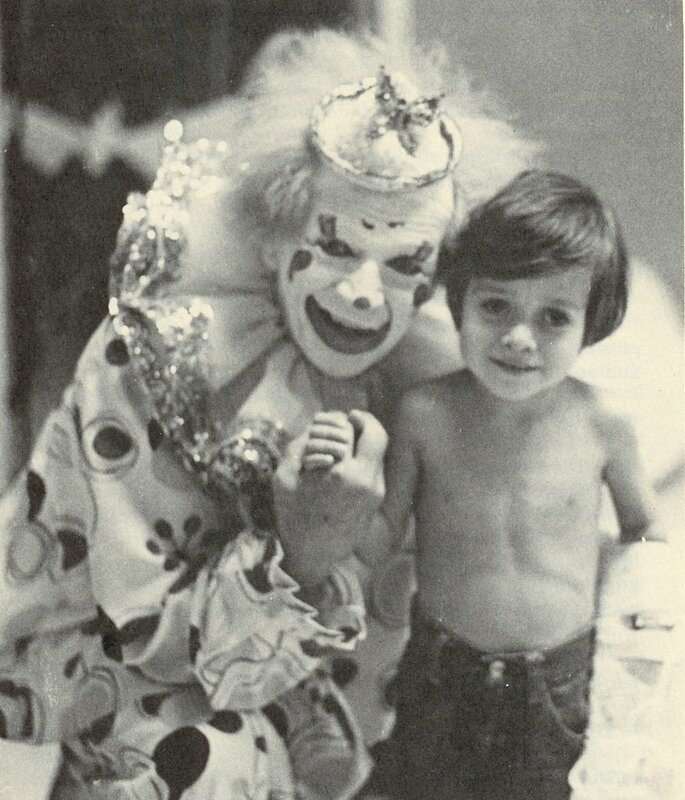 Bobby Kay with Peter Trento at Children's Hospital in Los Angeles, one of hundreds, possibly thousands, of hospital visits Bobby made during his long career. The clown enters the now deserted fifth-floor playroom of Children's Hospital in Los Angeles and Bobby Kay is lost to us. He carries a bagful of tricks - metal rings that magically separate, kerchiefs that tie and untie mysteriously, an elusive rabbit that keeps changing form behind a tiny wooden door, a bird in a cage that disappears, cage and allbefore our very eyes - and his large slayed feet carry him from room to room as small faces, somber a moment before, light up with smiles. The circus has not passed them by, and they react eagerly to the clown's happy smile and constant chatter. He approaches a boy whose bed is a mass of pulleys, counter-weights and tubes. His bike had been struck by a car, throwing him 30 feet through the air. On the critical list for the first three days he is still in constant pain because his system will not accept any more drugs. He lies on his side, unmoving, as the clown squats down and peers through the bars of his raised bedside. His grandmother, who has taken turns with his mother and father on a 24 hour watch, looks on anxiously from the crowded doorway. An interesting thing has happened since the clown began his rounds; nurses, aides, even doctors, have begun following this whitefaced Pied Piper from room to room, responding as the children do to his inexhaustible store of good cheer. They know the full measure of his magic because they are aware of the extent of their small charge's pain. Watching the adult professionals react is a revelation; this funny, happy, silly clown is transforming sickrooms into little pockets of joy and hope - a rare demonstration of wonderful, though fleeting, miracles. "Do you feel like saying 'Hello'?" the clown asks. After a moment the boy lowers his fingers from his eyes. He is crying, has been for four days. Sometimes he screams aloud at the car to stop, just as he did at the moment of impact. Now he looks uncertainly through tear-filled eyes at the clown. "Your grandma tells me you've been a brave boy." The boy looks but gives no sign. "I've brought a bunny rabbit to see you." The patient stares at the little wooden door pressed against the bars as the clown pretends to peek behind it. "Yup, he's there all right. Want to see him?" A hesitation, then a nod, yes. The clown whips open the door and a picture of Mr. Rabbit stands revealed. "See? He came all the way from the circus to see you." "Now watch." The door is closed and reopened and there stands Mrs. Rabbit. The tears have stopped and the hand moves away from the face. The clown closes the door. "Would you like to see who's behind the door now?" He presses it closer to the bars "There's the knob. You can open it and find out for yourself." Slowly, tenatively, the hand slides across the pillow and touches the tiny doorknob. "Go ahead," the clown urges. The boy cautiously opens the door; both Mr. and Mrs. Rabbit have disappeared, leaving only a big bunny tail. A smile creeps slowly over the youngster's face, then, as the clown reacts with wide eyed astonishment, the little boy laughs. Sharp intakes of breath and smiles from the adults please the clown better than any big top applause. Somehow a corner has been turned; somehow even the professionally skeptical doctors and nurses know that pain will be eased and recovery speeded. The grandmother kneels by the bed as the boy whispers into her ear. 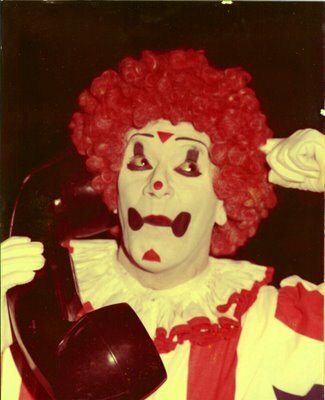 She turns and call to the departing clown. "Mr. Clown," she says, fighting back her joyful tears, "he wants to kiss you." As the clown leans over and a small hand reaches up and shyly touches his face, more than one nurse turns away, dabbing at her eyes with a tissue.